On January 5th Fraser Anning, an Australian Senator, attended a far right rally at St Kilda beach in Melbourne. The rally was called by former United Patriots Front leaders Blair Cottrell and Neil Erikson, men with criminal convictions for serious vilification of minorities – that’s an speech that either threatens or incites violence against a target. He flew down from his electorate of Queensland using his parliamentary entitlements, that is money provided to him by the Australian tax payer. His Facebook post announcing he would be attending the rally received over 5,200 likes, over 3,400 shares and over 1,000 comments. While there were many problematic comments on his post, one stood out for us. In response to a comment saying “Deport them problem solved ! !”, another poster replied, “please don’t deport them – shoot them fcuking dead otherwise they come back this side”. This comment inciting violence was not posted by one of Senator Anning’s constituents in Queensland, or even by an Australian. 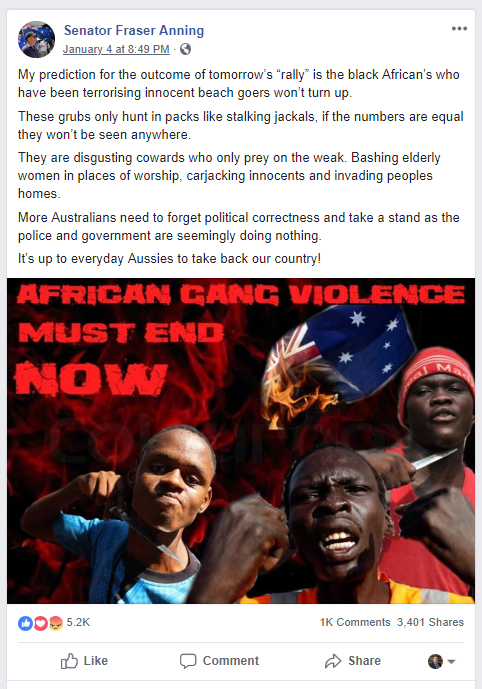 This comment inciting violence in Australia was posted from South African by one of Senator Anning South African fans. That same day we reported the comment to Facebook as a breach of their community standards. We also send a message to Senator Anning with the comment and a link directly to it. Our message history shows that Senator Anning, or at least someone with administrator access to his Facebook page, saw the comment around 6pm that same day, January 5th. Neither Senator Anning, his staff not Facebook has so far removed it, and it’s now JAnuary 16th more than two weeks later. Senator Anning has previously used his parliamentary entitlements to fly to Melbourne for an Australian Liberty Alliance (ALA) event. The ALA is an anti-Muslim political party. One of their candidates in the recent Victorian election, Avi Yemeni, in the past worked with Neil Erikson on anti-Muslim rallies, notably in support of a visit by the Alt-Right’s Milo Yiannopoulos. Incitement to violence and hate in comments posted in online space Avi created and managed have been documented by us in the past as well. A picture of Senator Anning posing for a photograph with the leader of Squadron 88, a group that was active distributing antisemitic leaflets back in 2014 is also now circulating online. The 88 stands for the 8th letter of the alphabet “H” and 88 is short of HH an abbreviation of Heil Hitler. We’d documented some of activities Squadron 88‘s previous activity and ran a successful campaign to have their Facebook page closed. Senator Anning’s activities are now funded by the Australian public. He has the ability to appoint staff paid for by the tax payer. His employer, the Australian public, has a right to expect a certain standard from him. Expecting him to manage and moderate his Facebook page to remove incitement to violence and other unlawful comments is perfectly reasonable. Especially when he has been notified of the content and given weeks to respond. When he chooses to engage in activities that increase the risk of such comments appearing on his Facebook page that responsibility for proper moderation only grows. He can’t just ignore the incitement and hate. 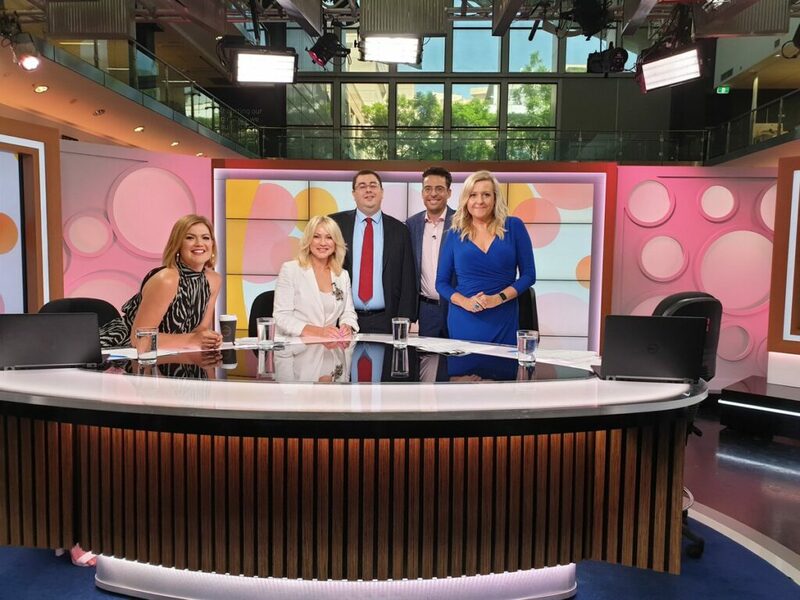 This morning on Studio 10 (Channel 10 TV) the Online Hate Prevention Institute’s CEO, Dr Andre Oboler, discussed the problem of the far-right in general and the comment which Senator Anning won’t remove. As he told channel 10, the far right in Australia includes those that can accurately be described as Nazis – people who subscribe to a Nazi ideology and glorify Nazism and Hitler – their numbers are small but they can’t be ignored. They try to get many ordinary Australians to stand with them and that is dangerous for our society. In 2015 they managed to build a mass movement. To stop them doing that again, we need to call them what they are and warn people not to lend their support to Nazis. We need to do this now before they can again grow their movement. If we don’t stop them, those ordinary Australians who are mixing with these Nazis are at risk of being poisoned with their hate. From there it can move into the workplace, families and daily life. That creates a climate of hate and fear we simply don’t need or want here in Australia. The Online Hate Prevention Institute is a Registered Australian Charity. Our work is supported by donations from the public ad as a very small charity, every donation makes a huge difference to us. You can donate to support our work using the charity donation button on this Facebook post, or support our campaign tackling the far-right in the lead up to January 26th.